Combusting bits of tech are nothing new, and now two firms are stepping in before more people and pillows are scorched by their product. With guidance from the US Consumer Product Safety Commission (CPSC) and other regulators, Google and HP have issued a formal recall of the HP Chromebook 11's original, problematic charger, citing fire and burn hazards. Google has received nine reports of chargers overheating and melting, according to the CPSC. One report outlined a charger inflicting a small burn on a consumer, and another indicated "minor property damage to a pillow from an overheating charger." Consumers who purchased the HP Chromebook before December 1 can order a replacement by submitting an online form or by calling Google at (866) 628-1371 between 5 a.m. and 7 p.m. PST. The power-provider drama heated up in mid-November when HP and Google halted sales of the Chromebook 11 due to its faulty juicer. At the time, HP said it and Google were working with the CPSC on "the appropriate corrective action," and advised consumers to avoid using the original charger at all costs. 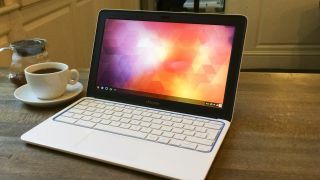 Google wrote in a blog post today that the companies have resumed Chromebook 11 sales, though with replacement chargers. The recall will affect about 145,000 units, and consumers in the UK, Australia and other international markets can contact Google about replacement chargers as well. Check out this FAQ for country-specific serial numbers. Google Glass has some competition in the form of these AR headsets.